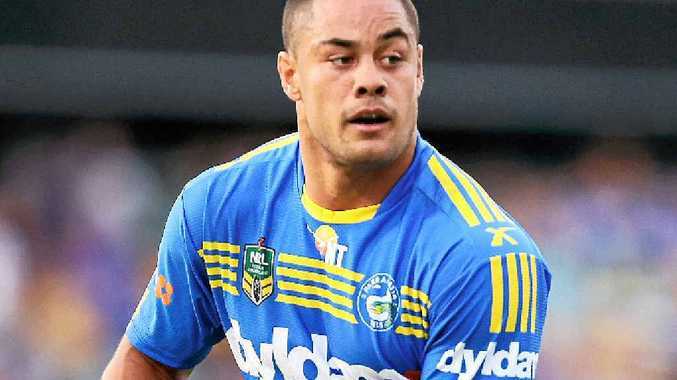 The Broncos will be wary of Jarryd Hayne when they play the Eels tonight at Suncorp Stadium. CONSERVATIVE Brisbane coach Anthony Griffin has labelled Eels fullback Jarryd Hayne the best player in the game when he is on song. Griffin's comments may be part of the mind games ahead of tonight's clash at Suncorp Stadium, but there is no argument the Parramatta fullback is playing some wonderful football off a rolling forward pack and a new halves pairing. Recalled No.7 Chris Sandow and ex-Bronco Corey Norman gelled instantly in their first game together as the Eels easily disposed of Penrith 32-16 last weekend. "Jarryd Hayne on his day is the best player in the game, and Chris Sandow is a class player," Griffin said. "We've all seen what a good player he (Hayne) is. For me, when he plays State of Origin he's their (NSW's) best player. "We will have to be at our best defensively to do a job on him." Griffin said he had been most impressed by the new-look Eels under rookie coach Brad Arthur, especially their dangerous attack down the left side where blockbusting Fijian winger Semi Radradra has turned into a try-scoring machine. "They've certainly got some great strike power. They put the Warriors away easy and then had a tough night against the Roosters. They should have beaten Manly at Brookvale, which not many sides can do. They were unlucky that day ... I thought they were the better side." Griffin dismissed concerns picking Justin Hodges ahead of schedule from his Achilles injury was a gamble. "We left it up to him," he said.